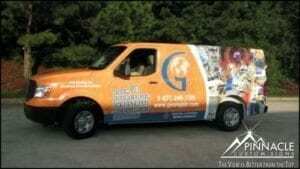 Vehicle graphics are one of the most cost-effective ways to advertise your business. 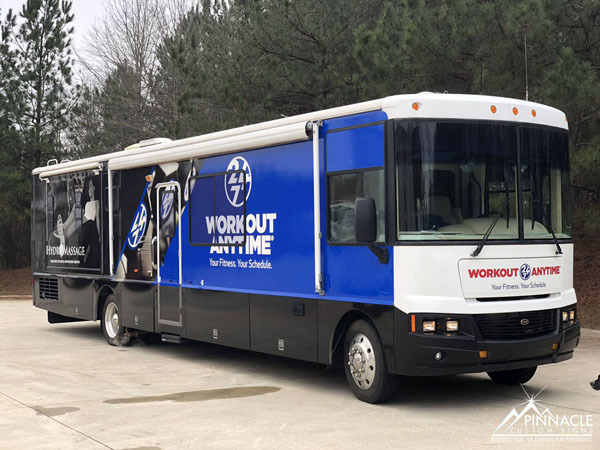 They are often described as “mobile billboards” since they advertise wherever the vehicle travels: building brand recognition and advertising your company. This is especially true when you are traveling the busy roads in the metro-Atlanta area. As one of the most affordable ways to make a statement, Vehicle Graphics are skyrocketing in popularity. 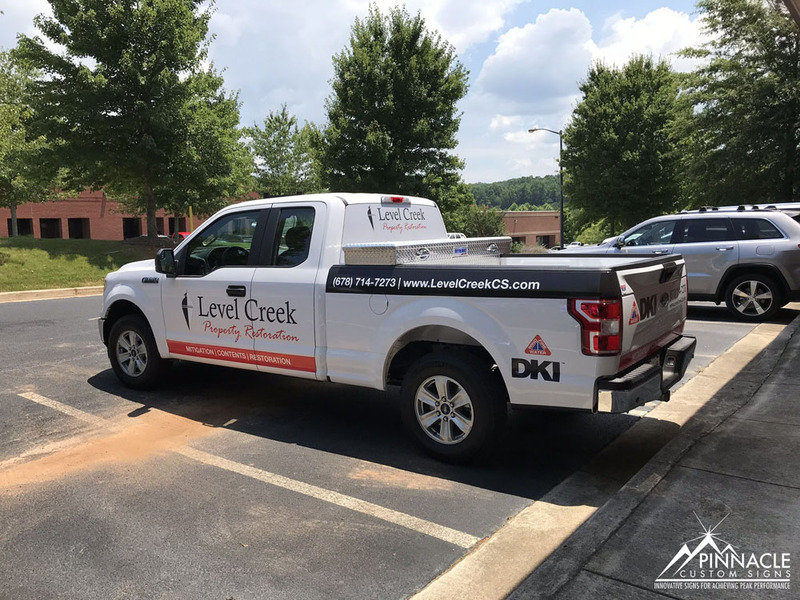 Cost-effective and informative, putting graphics on your company vehicle increases exposure, displays information to your potential customers quickly, and establishes company identity. And whether it’s one car or a fleet, your company’s reputation is on display — your vehicle graphics must showcase your professional image. Few signs deliver the value of a quality vehicle wrap. We have the insight and experience to get your job done right. We take the time to work with you to understand your message and help to design your vehicle graphics to get the most “bang for your buck”, while staying within your budget. Vehicle graphics range from the application of vinyl lettering and decals to partial and full vehicle wraps. We have the expertise to apply graphics all types of vehicles: cars, sports utility vehicles, vans, service trucks, pick-up trucks, boats and more. 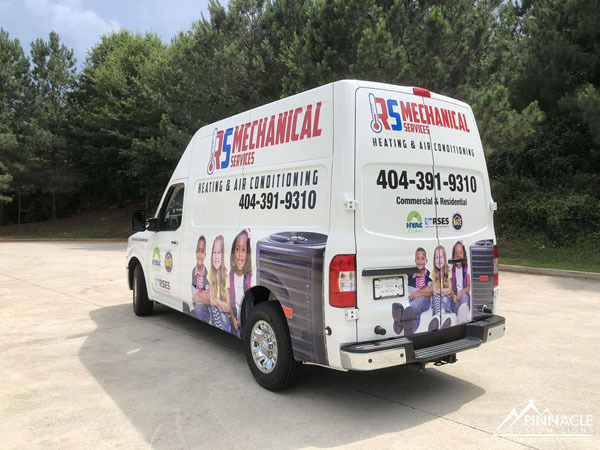 Let us help you with creating graphics for your vehicle that will get your business recognized by your customers and potential customers wherever you may go. If you’d like for us to contact you about a vehicle graphics, please complete the form below and click the send button. 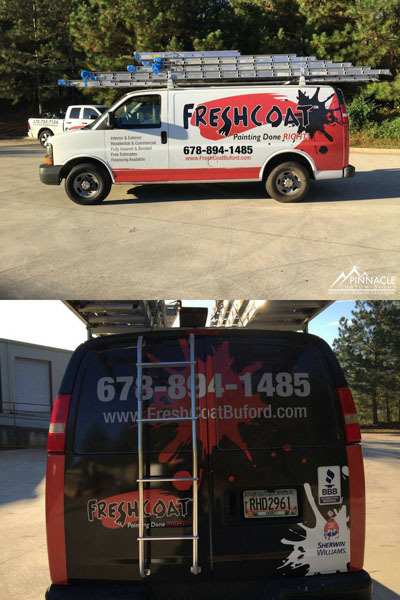 Or, you can call (678) 714-8700 and let us see how we can help with your vehicle graphics project. 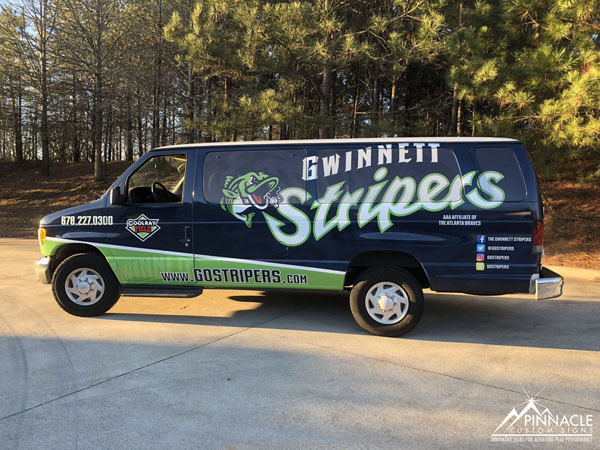 Full vinyl wrap for the Gwinnett Stripers van. What Are Rear Window Graphics? Why work with Pinnacle Custom Signs? 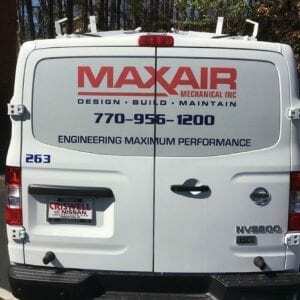 How much experience does the sign company have with vehicle graphics? What is the sign company capable of doing? Will they work with you to design a truly effective vehicle wrap? Where should you go for vehicle wraps? How far? Frequently asked questions about car wraps. How does a vehicle advertising benefit my business? What is the difference between a car wrap and a truck wrap? 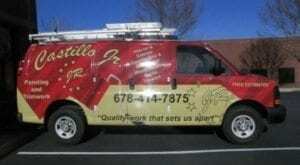 What makes a great van wrap? What kinds of vehicles can you wrap? Where can I have my boat graphics printed? What do I need to do to keep the graphics in good condition? When looking at vehicle graphics, you first need to look at your budget and the parameters of your vehicles. We always ask prospective customers upfront what their budget is, not because we want to max out their budget, but because we want to give them the best options available. Typically, there are 5 different types of graphics. Here is a quick list of them and their average costs per vehicle**. ** Average cost is just an estimate, a ballpark figure. Contact us for a more accurate estimate of what your costs may be. It’s important to talk to an experienced vehicle wrap company about your ideas; we can help you determine what type of vehicle graphics is best for your business. 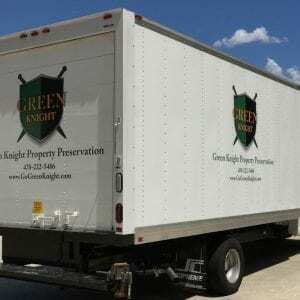 Magnets are an excellent option for businesses that employ contractors or who need to park their vehicles in HOA or similarly restrictive areas. They allow you to only have the graphics on your vehicle when you need them, and they allow you to transfer the graphics to other vehicles. Most sets of magnets have a driver side and passenger side magnet with your business logo, phone number, and other important information. Typically, you’ll pay about $100 for a set of quality car decal magnets. Car decals are different from partial wraps because they aren’t intended to cover a large portion of a vehicle. It is a more permanent option than car magnets and is much more durable. Businesses usually choose to do decals when they want to present more information and/or improve the look of the graphics. 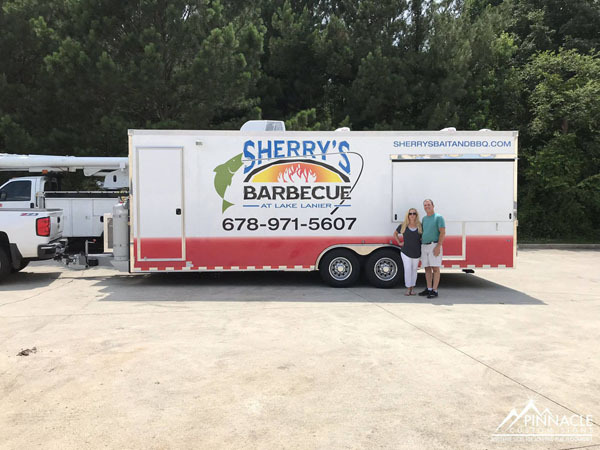 The customer perception of a decal versus a magnet is that a company is more established and reliable when they use a more permanent vehicle graphics option. Car decals cost about $350 to $1000 depending on the size & number of the graphics and the vehicle. When you are driving around town, you most frequently notice the backs of other vehicles. This is why rear window graphics are a great option for businesses. Someone is more likely to notice and remember more information when they can easily see the graphic – like when they are stopped at a red light or in traffic. Putting graphics on your windows isn’t difficult and doesn’t have to interfere with your visibility when driving. Perforated vinyl is the most commonly used material because it allows you to see through it while still clearly displaying the graphic. You can use opaque vinyl for some graphic elements, but we don’t recommend using a large amount of it on a rear window because it does reduce your visibility. Typically, rear window graphics cost about $250 to $350, depending on the size of the graphics. 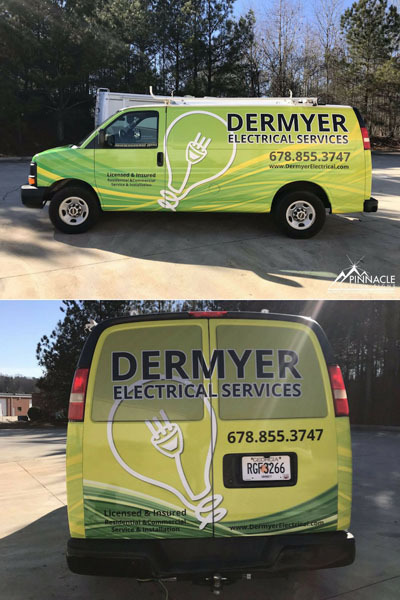 Partial wraps are an excellent, cost effective alternative to full wraps; typically used when you can incorporate the color of the vehicle with the graphic. It saves you money from a vinyl / wrap standpoint while still delivering a clean, crisp look. 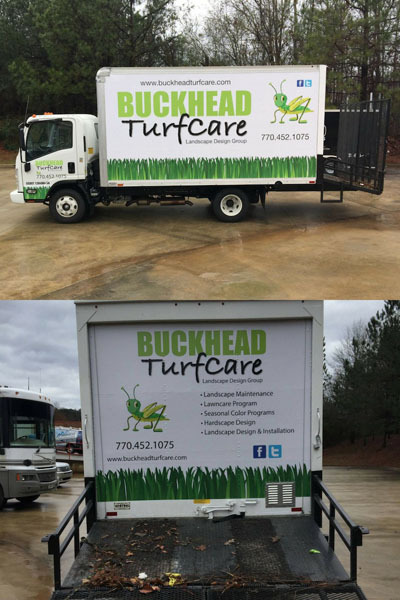 For example, Unlimited Landscaping in Atlanta gets vehicle wraps for all of their vehicles. 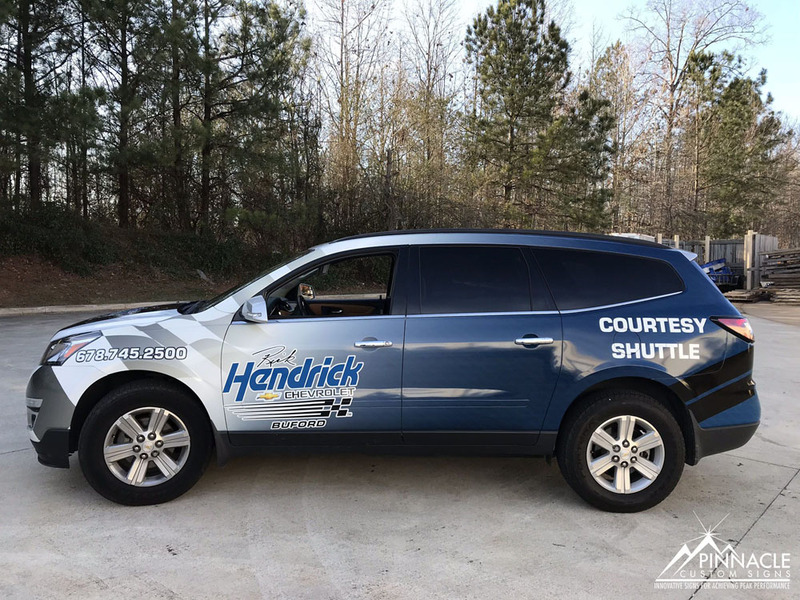 Because their colors are green and blue, they purchase vehicles that match their company’s blue color and do a partial wrap to add their graphics to it. Typically, a partial wrap will cover over 50% of the vehicle. The average cost is $1400 to $2000 depending on the size of the vehicle and other factors. 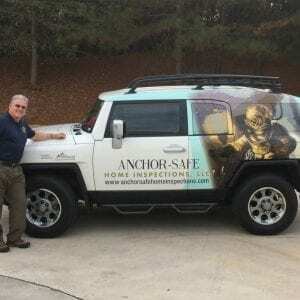 While many full vehicle wraps are work vehicles – trucks, cars, vans – you can also do full wraps on vehicles like boats. Full vehicle wraps are the most eye-catching options available. You get the most space possible in which to convey your business image and message. Many of our customers use full wraps on their vehicle fleets to provide a consistent look across many different types of vehicles. Full wraps can cost from $2000 to about $3500 depending on the size of the vehicle. A color change wrap is an interesting form of a full wraps that focuses on changing the color of the car, rather than adding business graphics. It’s often used to add artistic graphics to a vehicle, as opposed to just simply changing the color. Examples include a chrome look, gradients, etc. These types of wraps can be more cost effective than a paint job ($8000+). 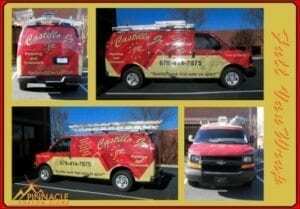 Pinnacle Custom Signs has years of experience designing and installing vinyl graphics on a variety of vehicles. Our team of experienced installers can take on any size project. Our designers know how to take your branding and your message and make an effective, affordable wrap design that will stand out. Here are some things you should consider when looking for a sign shop to handle your custom vehicle wraps. The experience of the company is good, but the experience of the people at the company is better. Employees come and go, so judging a sign company based solely on past projects isn’t the best idea. You want to look at what certifications the installers have. For instance, one of our team members, Trent, holds certifications from Avery and is a PDAA Master Certified Installer. He has years of experience with everything from normal car wraps to color change wraps. You want to look at the resources that the sign shop has at their disposal, particularly their workspace and their equipment. Different types of vinyl require specific temperature and humidity conditions in order to be installed. You want to see if they have the ability to accommodate your vehicle(s) and design requirements. You also want to look at how they will store your vehicles. While some jobs can be done in a day, other jobs may take longer, particularly if you are installing fleet graphics. Ask about the security and safety measure that they take to ensure that the vehicles on the property are not damaged or stolen. Anyone can throw some images and text together, but only experienced designers know how to design in 3D and how to maximize the effectiveness of your message and branding. Our design team has worked on everything from Priuses to golf carts to boats. 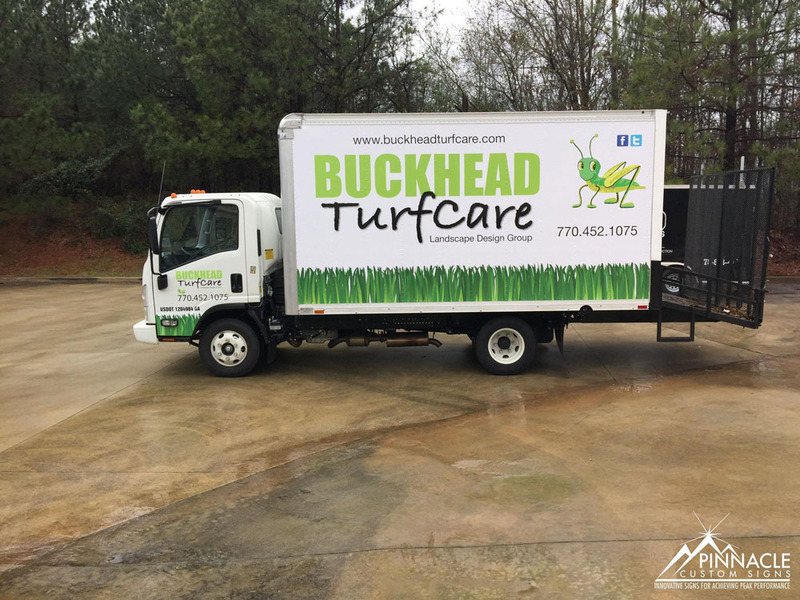 In many of our fleet wrap projects, we have created vehicle graphics for a variety of types of vehicles (box trucks, trucks, cars) that maintain the same consistent branding. With our years of experience, we know how to create wrap designs that will make the best use of your vehicles space and your budget. Finding a quality, trustworthy sign shop is important. With vehicle wraps, you have the added benefit of being able to choose from sign companies in your area or further away. 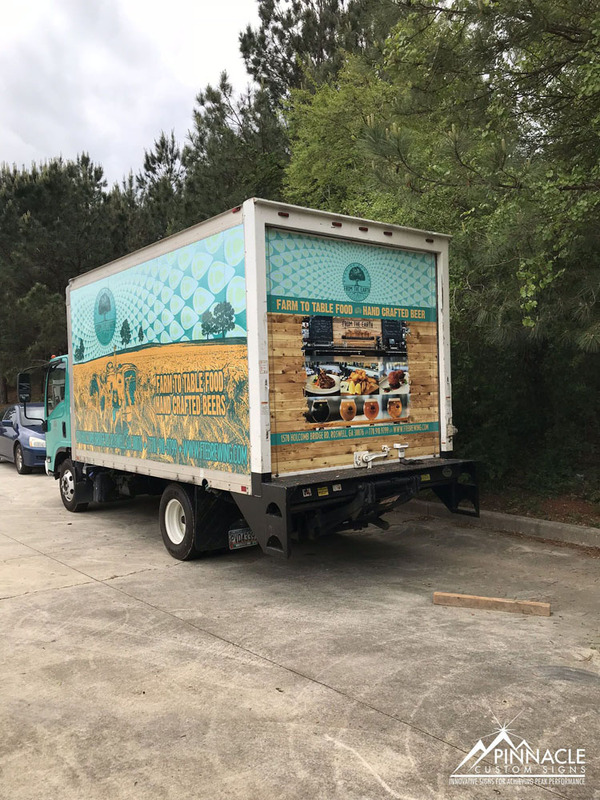 We have had businesses bring in vehicles from out of state in order to ensure that their branding remains consistent throughout their franchise locations. However, keep in mind the added cost of gas and manpower to transport the vehicle(s) to and from the sign shop. However, when it comes to working with the best sign shop, it’s often worth the travel expense. If you are not in a feasible driving distance, we can do the print job in house and ship the vinyl graphics to one of our trusted installers in another state for application. It’s a great way for companies to be consistent with their branding without the expense of transporting the vehicles for a longer distance. Always check online reviews about a business prior to working with them. Reviews are a good way to understand what kind of people work at the business and will give you an idea of some areas to look out for. For example, if a business has favorable reviews with the occasional complaint of communication issues, you can factor that into your decision. At Pinnacle Custom Signs, we pride ourselves on our excellent customer service and high-quality work. Take a look at our online reviews in Google, Yelp, and Facebook. Not to brag, but we have a 4.9/5 rating on Google, 5/5 on Yelp and 4.7/5 on Facebook. Wrapping a car in vinyl graphics is a great way to advertise your business or change the look of your car with minimal cost and with many benefits. Vehicle wraps constantly advertise your business while on the road – providing more exposure at a lower cost than most print advertisements. The sign industry is constantly improving on the quality and the application of vinyl film products used for graphics. The design choices are endless with there being a wide variety of colors and textures (like matte). Car wrapping has become an affordable, effective option for businesses. We get asked a lot of questions about car wraps and vinyl wraps in general. Here are the answers to some of the most frequently asked questions. How long a vinyl wrap lasts depends on the type of material and the conditions it is put through. A vehicle that is driven daily for most of the day (ie. service vehicles) and exposed to direct sunlight, wind, rain, etc. will not last as long as a vehicle that is driven less frequently and/or parked in a sheltered location. A 3M vinyl wrap can last for 5-7 years (depending on use and exposure). 3M warranties their vinyl film for up to 3 years for vertical surfaces and 1 year for horizontal surfaces. The best way to ensure long use of your vinyl graphics is to properly maintain it. Keep in mind that vinyl wraps can also act as paint protection to a degree. This is because it adds a layer of protection and can be removed without damaging the paint when installation is done correctly and if the graphics are updated on a regular basis. The length of time the wrap has been on the vehicle and the exposure to the elements (ie. sun exposure) can both make it difficult to remove the vinyl without causing damage to the paint. Updating the vinyl on a regular basis will help prevent damage and keep your vehicles looking fresh. How should I take care of a wrap? Constant exposure to the elements will shorten the lifespan of your vinyl wrap, however, there are steps that you can take to extend the lifetime of your wrap. Wash your vehicle at regular, frequent intervals. Do not use high pressure as this may cause the vinyl to peel. Do not use the machine car washes for the same reason. Hand washing your vehicle is your best option. Use a blend of mild soap and water to wash your vehicle. Test a portion of your vinyl vehicle graphics with the solution to ensure that it will not harm the wrap. Biodegradable solutions are often a good choice because they do not contain as strong chemicals as other solutions. Always start at the top of the vehicle and work your way down. If possible allow to air dry or use a microfiber cloth and gentle pressure. And, whenever possible, park in sheltered locations – in the shade, in a parking garage or under a canopy. Will my insurance rates change if I wrap my vehicle? No, and yes – it depends on your insurance provider. We highly recommend that you talk with your insurance company about your investment in car wraps because they may not cover it in your policy. If you are not covered for damages to your wrap, you may end up having to pay out of pocket for any repairs to the wrap. Some insurance companies will either add it to your existing coverage or will offer you additional coverage for your wrap. Keep in mind though, that they will probably not cover the cost to replace the wrap due to normal wear and tear. What should I consider prior to purchasing a work vehicle to wrap? for your business, you should consider a few things before purchasing. First is color. Vinyl wraps can change the color of your vehicles without an issue, but you could end up saving money by selecting a particular color of vehicle. We are often able to save businesses money by doing partial wraps instead of full wraps by incorporating the existing color of the car into the design. On the other hand, a full wrap would protect the car’s original color and paint job which could help you if you later want to sell the vehicle. Second is the type of vehicle. Whichever vehicle you choose should be chosen based on how you are going to use it. If you have multiple vehicles to choose from, you should then consider advertising space. A van has a larger surface area on the rear door and windows than a work truck. You should also consider that perforated or opaque window graphics can provide some security for your vehicles by making it difficult/impossible for people to see inside of the vehicle. This could help you protect valuable equipment. Why is a wrap better than a paint job? A color change wrap or full graphics wrap can be a better choice than a custom paint job for a number of reasons. The vinyl adds an additional layer of protection to your vehicle which can help protect it from the normal wear and tear of the road. You can easily have the wrap removed without damaging the paint job. Car wraps are more affordable than a paint job and more customizable. Dealers often have limited color choices available. A full wrap can give you the ability to customize the color and design of the vehicle. Or, if you only want to change a portion of the vehicle you can do so easily and be able to remove it later without damaging the paint. Keep in mind though, that it’s best to have a professional install a vinyl wrap of any size. DIY solutions are often temporary and can damage your vehicle if not done correctly. Service-based businesses often have the highest ROI on vehicle wraps. Because of this, we do a lot of vehicle graphic installation projects for box trucks, pickup trucks, trailers, vans, and other work vehicles. Whether it is one vehicle or a fleet, we can handle any size project – even race cars and planes! Putting custom vinyl graphics on your work vehicles is a very cost effective way to advertise your business. The graphics act as a mobile billboard, advertising your business wherever you go, which means that it’s more likely to target your target market. Commercial vehicle advertisements have a high recall rate (~97%) and are more effective than traditional print marketing methods. This is because of the lifespan of the graphics (2-7 years) and exposure to your target market. When considering how effective mobile advertising is for your business, think about how often your vehicles are driving around. For example, a residential HVAC company will gain a great deal of exposure because they travel to various job sites daily. Those vehicles are often parked in view of residential streets, so neighbors see the vehicle and subsequently the HVAC’s branding. If they are also having HVAC issues, they may contact that every company to address the issue. Custom vehicle graphics also gives you the ability to “recycle” your vehicles. If you always want to have vehicles that are no more than 5 years old, you have the ability to easily remove the graphics when it’s time to sell a vehicle and purchase a new one. The key difference when wrapping a car versus a truck would be the size of the vehicle and the necessary durability of the wrap. The advertising space on a van is going to be greater than a 4 door sedan, allowing you to make a bigger statement. On the other hand, a smaller vehicle is going to cost less. Several companies produce vinyl film for car and truck wraps. The durability of the material may vary between brands and models. A truly great vehicle wrap catches the attention of viewers and conveys the message quickly and effectively. It starts with laying out what your goals are for the wrap and defining your company’s branding. The design should meet those goals while being as clean and bold as possible. Viewers only may only have seconds to look at your vehicle; if your design is cluttered and confusing, they won’t remember much. The cost to wrap a vehicle depends on the size of your custom vehicle graphics. A full wrap for a box truck may cost more than a full wrap for a car. However, the shape of the vehicle is going to affect the price more. A car with lots of curves may be smaller than a box truck but, because of the complexity, it will cost more to wrap. The curves take more time and skill to get right than a large flat surface. The first thing you need to determine is the size of the wrap. Some designs can be done as a partial wrap or as just vinyl decals. This is especially possible when the color of the vehicle is used in the design and the design has whitespace. Vinyl wraps can be used on all sorts of vehicles included planes, cars, trucks, boats, motorcycles, golf carts, and more. Designing the wrap is one of the more challenging aspects of using different types of vehicles. Every vehicle has different dimensions, curves, and surprises that can make it difficult to design and install. 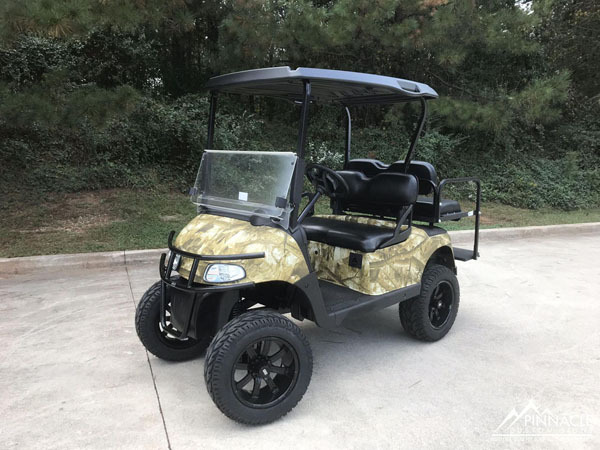 Our team has experience in a wide variety of vehicle wraps, including trucks, cars, boats, and golf carts. Boat wraps are unique due to the environment they are in. The wear and tear of being out on the lake or sea is more intense than on the road. That is why vinyl film makers like 3M and Avery have different types of film for different applications. Being located so near Lake Lanier in Georgia, we often are asked about boat graphics from simple decals with the boat’s name to full wraps for fishing tournaments. Here are some frequently asked question about boat graphics. Not all sign shops are equipped to handle boat graphics. 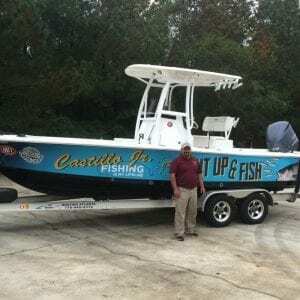 The design and application of boat graphics are different from that of cars or trucks. Talk with prospective sign companies about their experience with vinyl wraps for boats and do your homework before selecting a company. To start with, only use marine grade vinyl on your boat. Other types of vinyl are not designed to hold up under the constant exposure to water and sun and can end up peel or warping. This could cause damage to the paint job on the boat. Visually inspect the vinyl graphics periodically to check for damage. When cleaning your boat, be sure to keep in mind what chemicals should and should not be used on vinyl. Having an experienced vinyl graphics installer apply the graphics to your boat may give you the added benefit of warranties. If your graphics are damaged due to defects in the vinyl, you may be able to have them replaced with minimal cost. We have done many small signs for him and partially wrapped two vehicles: a KIA Soul and a pick-up truck, which can be seen in the two smaller pictures at the bottom of the page. With his business continuing to grow, he recently decided to add vans to his fleet. And, for the first time, he wanted a full van wrap instead of a partial wrap or enhanced graphics as we did in the previous two vehicles. there is a consistency in the look of all of Castillo’s vehicles. He sat down with our production manager and lead designer, Joanne, to start the process. Leonel wanted to keep some aspects of his previous graphics including color, font, and logos. However, he wanted the wrap to also highlight his painting business. After a few variations, Joanne came up with the interesting concept of having the wrap look like a newly painted wall, along with roller marks and a roller, while keeping the colors and text found on his partial wraps. The final design left no doubt that he was in the painting business. After the design and print, the install was completed and Leonel was extremely happy with how branded his new vehicle is now, and plans to do a second van in the next few weeks. He is looking forward to getting his brand noticed as his crew drives around town sporting his new vehicle design. Shortly after we moved into our new facility, we had a visit from Margie Petzold from Global Electronic Services, who saw our sign out front. Global Electronic Services provides industrial electronic repair and surplus solutions for all models and manufacturers of industrial electronics, motors and hydraulics. Their headquarters are located in four buildings at the back of the industrial complex where we relocated last winter. Margie mentioned that Global had a need for a lot of different types of signage, and while they had a company that they had been working with, they thought that with us being close to their facilities, they wanted to try using our services. 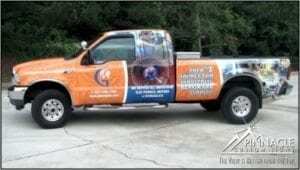 The first project on the plate was for a Ford F-350 truck wrap. The design phase for this project took quite a bit of time before it was finalized. It featured several photos showing examples of their unique equipment and services such as motor rewinding and balancing services. Because the photos need to be enlarged quite a bit, it took some time to get the photos which had high enough resolution to provide high quality images showing what they wanted their potential customers to see. The design also included a listing of all the different types of motors & electronics they can service. Predominantly featured in the design was their corporate colors of orange and blue – two complementary colors which are certain to draw the attention of other motorists. The orange sections had their logo in a “ghosted fashion” using a step and repeat pattern, building their brand recognition. Shortly after that, we were asked to wrap a Nissan NV commercial cargo van. As many fleet wraps do, this van wrap had many of the same design features as the F-350. However, since this was a much larger vehicle, there was more “real estate” for additional graphics. A unique feature of this vehicle wrap, was that they wanted the entire roof wrapped, something that isn’t typically done on large vehicles unless they are driven near tall buildings where the roof will be seen often. Since we were wrapping the roof, and the rest of the graphics were quite busy, the design was kept simple and just featured their logo, a large letter “G” with a globe, on the custom orange background. 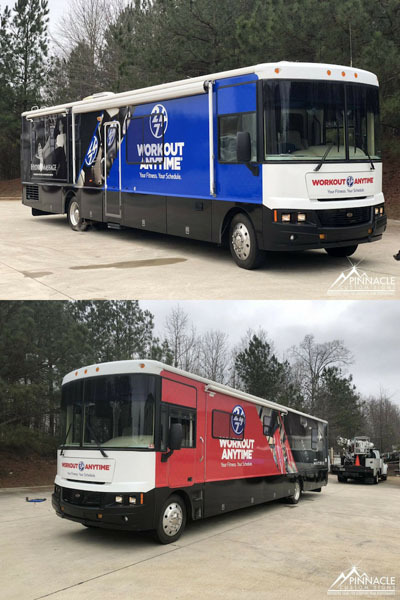 Since completing the two vehicle wraps, we have worked with Global on a few other projects, all of which keep a consistent look to their brand. Being a full-service sign company, we are able to fill many different sign needs, not just vehicle graphics. If you have several different sign needs, click the button below to contact us and get more information.